Looking for an alcoholic drink that's different from your typical bar order? Look no further than pickle shots at Pickles Pub in Ocean City, Maryland. SALISBURY, Md. (AP) — Looking for an alcoholic drink that’s different from your typical bar order? 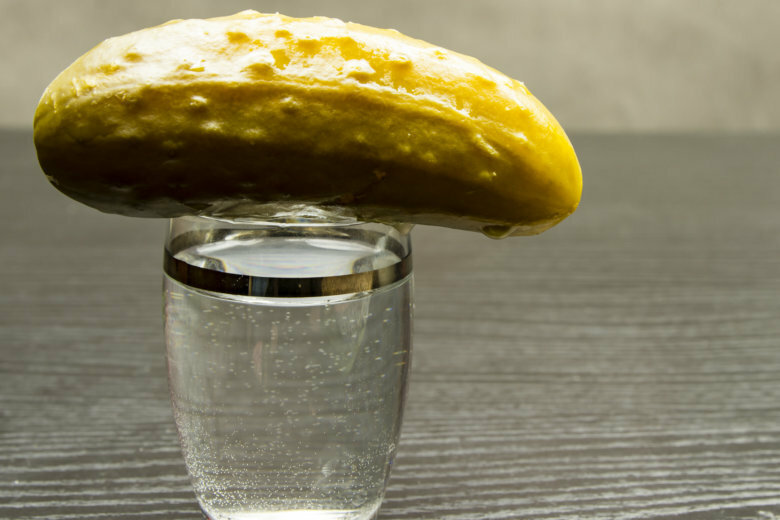 Look no further than pickle shots. Pickles Pub, located at 706 Philadelphia Ave. in Ocean City, made a name for itself serving up its infamous pickle shot, an intoxicating combination of pickle juice and vodka. Customers love it so much owners Justin and Brittney Acita decided to bottle it for fans of the drink to enjoy at home. “It’s a unique flavor,” Justin Acita said. The couple took over the bar in 2015 and learned about the pub’s pickle shot from its founding owners. Justin Acita explained one morning the original owners of Pickles Pub woke up hungover and were looking for a cure. They decided to take shots of pickle juice and Jose Cuervo, a tequila brand. The recipe later evolved into vodka and pickle juice. The Acitas originally sourced their pickle juice from a business in Camden, New Jersey. Today, the restaurant uses the same product from the same business, but now sourced through Sysco. Justin Acita said Pickles Pub serves up about 100,000 pickle shots a year. The restaurant also serves it up in various cocktails including its Bloody Mary and a martini. “We’re just selling so much of it,” he said. Since taking over Pickles Pub, Brittney Acita said they’ve always wanted to bottle the famous pickle shot as they constantly get asked by customers if it can be purchased to take home. “We need to make this happen,” Brittney Acita said. After testing nine different batches, the Acitas said they found the bottled formula that tasted exactly like the shots in Pickles Pub. Brittney Acita said the task was left to Justin Acita as she’s expecting their third child. The bottled pickle shot uses the same pickle juice and gets its green color naturally. And if you believe it, Brittney Acita said the shot is known to prevent hangovers with the salt from the pickle brine. Customers can purchase the bottled pickle shots at Pickles Pub, 8th Street Liquors and some other liquor stores around Ocean City. To order a shot, customers can head to Pickles Pub, Hooper’s Crab House, Backshore Brewing Company, Hammerheads Bar & Grill and Taphouse Bar and Grille locations. Brittney Acita said they’re currently focused on distributing the product in Ocean City and its surrounding area for the first year. Afterward, they want to expand across state lines and are already getting requests for it. They’re also working on a sriracha shot which is inspired from the drink of the same name also sold at Pickles Pub. “There will be more in the future,” Justin Acita said.